A/W: The Perfect Time for Bronzer? Lately, I’ve had a bit of an epiphany - a bronzer epiphany, if you will. Up until a couple weeks ago, I could probably count the number of times I had worn it this year on one hand. 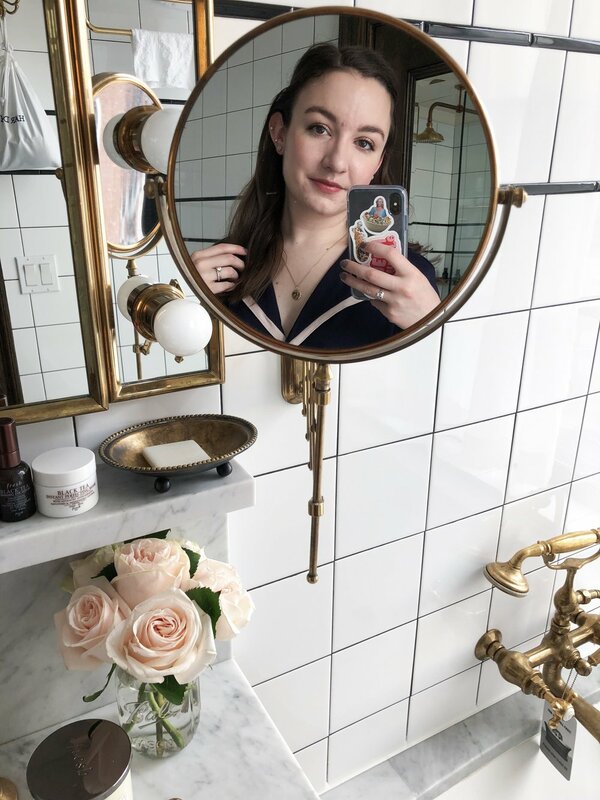 Maybe it’s because the picture that’s now in my sidebar made me realize how truly pale I am (it always surprised me when I would have to buy the palest shade of foundation/concealer - I never thought I was that pale). It could be because I’ve been trying to do a little contouring here and there and wanted it to look more cohesive. Whatever the reason, I’ve been having a real bronzer moment. The one that really kickstarted this new love of bronzer was the Make Up For Ever Pro Bronze Fusion in 15I. I have no idea why I suddenly felt the need to add this to my wishlist or even to buy it, but one swatch in Sephora had me sold. They have both matte (noted by an M in the name) and iridescent (noted by an I) shades in this range, and you know me - if it’s going to give me a glow, I’ll wear it. When swatched heavily you can definitely see the shimmer in it, but once applied to the face it only gives a really subtle glow. I’ve been dusting this around the perimeters of my face and on my cheeks in lieu of blush lately, and I really like the extra dimension it gives my face. Since I got one of the palest shades, it doesn’t make me look too sun kissed, just enough to not look completely ill. I got my hands on the Soap & Glory Solar Powder back in the spring through a beauty swap (sorry US readers, but this baby is pretty much non-existent here), and for awhile that got me excited about bronzer too. This one is raved about in the UK for good reason - it’s not too dark or too orange, and the two sides allow you to customize the shade you want. This one isn’t totally matte, but it’s not as sheen-y as the MUFE one. It seems that only the lighter side contains the tiniest hit of shimmer. After falling in love with the MUFE one, it’s given me more motivation to use this one too - they look quite similar on the skin, so I really reach for them interchangeably. The only other bronzer in my collection is The Body Shop Honey Bronze Bronzing Powder - another totally raved-about product in its heyday. This one has the nicest, dare I say it butteriest texture and is the perfect matte bronzer. The shade I have (the palest one, of course) leans a little on the pink side, so it looks really natural on my skin. I think what made me fall out of love with this one for awhile is that it’s perhaps too pale for me - it didn’t show up on my skin in the summer. But now that I’m actually into wearing bronzer again, and I’m doomed to get paler and paler now that we’re heading into winter, I’ll definitely be breaking this one out again. Are you a bronzer fanatic, or is it something you usually skip? I don’t think I’m quite at fanatic level yet, but I just can’t stop wearing it!